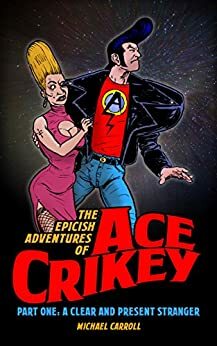 Introducing Ace Crikey, Special Agent, and his struggle with dastardly villains, warped logic, wince-inducing puns and his own rather tenuous grasp on reality. This first volume in this shockingly terrificesque adventure series also includes the award-winning short story that started it all! Unavailable for over twenty years, with good reason, this is your chance to jump on the Ace Crikey bandwagon before it even starts rolling! A short story with lots of puns delivered in a machine-gun fashion. Sure, it shows its serial origins, but if you don't like a joke, another one is along real quick. I liked it a lot. A good twenty minutes of laughing.